Glastonbury, in the Somerset region of England, seems always to have been a spiritual center, from Celtic May Day festivities, to Christian worship, to present-day New Age festivals. Human habitation dates back many centuries before the contemporary era, based on findings of flints, the remains of two lake villages that rose above the marshes on artificial islands, and hundreds of planks that formed walkways held by pegs driven into the soil. Those remnants date back to at least 2500 B.C.E., the same period in which many other sites, such as Stonehenge and Silbury Hill, the tallest prehistoric man-made mound in Europe, were being erected. Romans conquered Great Britain during the first century B.C.E. and established wharves on nearby Bristol Bay, thus enabling Glastonbury to become a shipping area. A legend has it that Joseph of Arimathea, who is mentioned in the Bible as the person who prepared Jesus Christ (c. 6 B.C.E.–c. 30 C.E.) for burial after his crucifixion, landed in Bristol Bay and established the first Christian church at Glastonbury. Later, according to some accounts, he traveled by sea and landed in Great Britain, bringing with him the Holy Grail. Several centuries later, according to legends, King Arthur's knights undertook quests to find the lost Holy Grail. When Joseph arrived in Glastonbury, according to tradition, he pushed his staff into the soil on a ridge called Wirral. That staff miraculously became a tree, the famous Glastonbury Thorn. It flowers around the beginning of winter, usually around Christmas time. It is not known when the original Glastonbury Thorn first appeared, but it was already centuries old and revered in the sixteenth century, when a Puritan cut it down because it represented a prideful icon of veneration. The Glastonbury Thorn is unlike any native species of tree in Great Britain and is reputed to be related to a thorn tree of the eastern Mediterranean area. The most distinctive and highest of the hills in the area is the Glastonbury Tor ("tor" is an old word for "hill"). An imposing hill, the tor can be seen from as far as 25 miles away. A ruined tower of a Christian chapel is perched on the top of the tor. 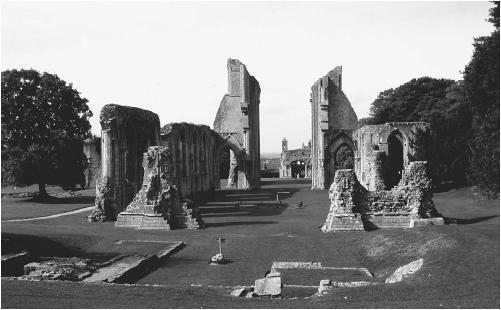 Nearby are the ruins of Glastonbury Abbey and, reportedly, the oldest Christian church in England. Glastonbury Abbey, a Christian monastery, was long established at the site when it became a focal point for Arthurian legends in 1190. King Henry II (1133–1189) had claimed that a bard told him that King Arthur's bones were buried deep at Glastonbury. In 1190, two monks at the monastery had a vision about a site where Arthur was buried in Glastonbury. After digging a hole sixteen feet deep, they claimed that they uncovered two stone markers and a giant coffin. Inside the coffin were the bones of a man and a woman together with a tablet identifying the remains as those of King Arthur and his wife, Guinevere. the Norman kings, whose invading armies had conquered Britain a century earlier and were still attempting to solidify their power, embraced the find. By the sixteenth century, when King Henry VIII (1491–1547) dissolved all Christian monasteries in Great Britain, the bones and artifacts alleged to be Arthur's were looted and the authenticity of the burial find was generally disproved. In the popular mind, however, the claim continued to be taken seriously because of the area's associations with Arthurian legends. Even to this day, the Pomparles Bridge that spans the River Brue that runs through Glastonbury is reputed to be the site where Arthur's sword, Excalibur, was returned to the Lady of the Lake. During the twentieth and into the twenty-first century, Glastonbury remains the site of official festivals and unofficial gatherings that celebrate its Celtic roots. Beltane Day, as the Celts called May Day, is celebrated with a festival for the rebirth of the sun. Maltwood, Katherine E. A Guide to Glastonbury's Temple of the Stars. London: Clarke, 1929.